Last year Southland Christian Church in Lexington, Kentucky ignited a storm of controversy when the church decided to cancel church services on Christmas day - a Sunday as it turned out. Church leaders from across the spectrum weighed in on the decision with opinions as wide ranging as their respective theologies. Now Southland is in the news again. The only thing the church has in common with its previous "infamy" might be its reluctance to be the media "target of the day." The cause of their move to the latest media milieu? Why, Britney Spears, of course. More specifically, the church's effort to reach out to "love Britney the way Jesus loves her." Sometimes it’s easy to see celebrities and the mistakes they make and think they are less deserving of our care and compassion—and our prayers. They have it all—money, beauty, success—but really, they only “have it all” according to a worldly definition. Take Britney Spears. In the world’s eyes, she’s young, beautiful, talented, successful, yet her life is in shambles filled with bad relationships and devastating life choices. If she were your next-door neighbor in the same situation without the money and success, wouldn’t you care about her problems? Wouldn’t you pray for her and offer her support and encouragement? Take a few minutes and write a note to Britney Spears, and bring it to the front of the stage between worship services this weekend this week. No preaching. No criticizing. Just love. As a church, let’s love Britney the way Jesus loves her. A month ago is a long time in cyberspace, of course. But the story took on new life after catching the attention of CTV.com late last week. When Fark picked up the scent and attached a "dumba**" tag, I suspect brother Weece began flashing back to last December. That's life on the cutting edge, I suppose. Jon and Southland took a lot of heat over last Christmas. In Frankly Speaking's opinion, most of it was deserved, some of it was not. Certainly the tone of much of the criticism was uncalled for. By comparison, this latest media mess is much ado about nothing. What is the worst Weece is guilty of? Maybe naivety. Maybe. At best, though, Weece is teaching his people to love those who've messed up their lives so thoroughly that the rest of the world (including many Christians) seem happy to sit idly by and watch them receive their comeuppance. I suspect that, if Britney receives the well wishes of the faithful at Southland, they'll point her to a God of love and not one of condemnation and irreversible judgment. Any flick with Nicole Kidman, Sam Elliot and Daniel Craig sounds like a pretty nice piece of celluloid. Not so according to an email I received from a fellow Southie earlier today. 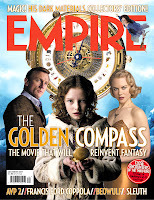 It seems The Catholic League is mounting a protest against the upcoming film, The Golden Compass. The fuss is not so much over the film itself, but in regard to the book on which it is based, The Northern Lights. Written by "militant atheist" Philip Pullman, The Northern Lights (released in the US as The Golden Compass) is a subtle refutation of the spirituality in C.S. Lewis' Chronicles of Narnia. The two books that follow The Golden Compass, however, fairly drip with anti-God sentiment and, at least from The Catholic League's perspective, anti-Catholic drivel as well. I checked out the trailer and, frankly speaking, it is amazing. I felt an instant pang of guilt for wanting to see a film that has already earned such negative reviews form Christian folks. What to do, what to do? Should I protest. Should I acquiesce? Should I give up and just remain silent? How about this. What would happen if myself and other Christians co-opted the film as an opportunity to talk about good versus evil. Perhaps by discussing the very existence of good and evil we confirm that there is a God. In The Problem of Pain, for instance, Lewis discusses the presence of evil as a confirmation of God's existence. I suspect I will go and see the movie. I certainly will read Pullman's book. If I want to be able to engage our world where our world is at, then, like Paul, I'm going to have to climb the steps to the Areopagus and sit among the thinkers who influence the direction of our culture. Thanks to all who've contacted me about problems with Frankly Speaking. I think I've got the bugs ironed out in my blogger template now. And as soon as blogger lets me post pictures I'll be putting up a new post from the Lansing State Journal. This article appeared in the Lansing State Journal the other day. If you click on the image, it should come up in your browser so you can read it . . . I love opening a new bar of antiperspirant! The nice curved arch. No white residue down the side of the plastic case. No stray armpit hairs stuck to the top. The whole experience screams, "today is going to be a good day!" When I opened up my new stick of Degree deodorant this morning and pulled the little plastic doohickey off to throw away I discovered that the folks at Unilever printed an inspirational message on the top of the white bar. This morning's encouragement: "Take the Risk!" Okay I will. No deodorant for me. . . 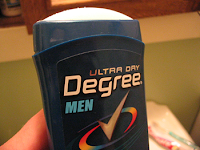 Check out this dude's take on his degree deodorant. Saw this inspirational billboard on the way home from work the other night. Tell that to King Saul. Or to Eli's sons Phineas and Hophni. The fact is, there are times when God fires his apprentices. I suspect the billboard's sponsor was trying to point out that God said he will "never leave us or forsake us," and he is right in doing so. Nevertheless, the Bible is pretty clear that we can reject Him. And when we do, God will write Ichabod over our ministry and find someone else to do the work of the Kingdom. My son Caleb joined the Grand Ledge High School band when we moved to Michigan this fall. This 195 person ensemble is amazing. Under the direction of 32 year veteran band director Michael Kaufman, the Marching Comets have become one of the premier bands in Michigan. Here they are performing the Grand Ledge Fight Song at last Friday night's football game. Turn up the volume! Crazy busy . . . This week has been incredibly busy! Tonight Caleb's band is in exhibition with several other mid-Michigan bands AND the Michigan State Marching Spartans! I'll write more about it later.